Gilchrest had bodacious blueberry muffins. Warm and hot and right out of the oven. Gilchrist's almond macaroons, which my mother always brought home. We got the blueberry muffins at Jordan Marsh. The macaroons were awsome, and came individually wrapped in wax paper envelopes. NONE of these stores decorated for Christmas until the day after Thanksgiving. That's right, NO Christmas decorations the day before Thanksgiving, full Christmas decorations two days after Thanksgiving. That must have been a fun intersection to get through back when vehicles were allowed 24/7. Both streets were one-way by the 1960s -- Washington towards the north, Summer/Winter towards the west [Boston Common]. Older photos show a stand in the middle of the intersection where a policeman stood to direct traffic. There wasn’t much vehicular traffic back then, so lights weren’t necessary. People looked (dressed) so much better in those days. 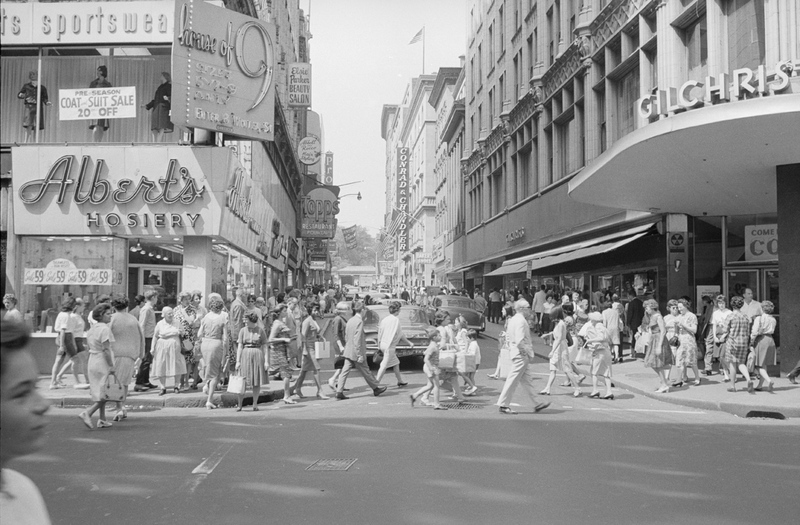 Downtown Crossing (or simply ‘Downtown’ as it was known) wasn’t scary the way it is today. The department stores were wonderful...sigh. Thanks for the great photo which brought back tons of memories! How the hell is dtx scary? It was full of nice white American people. Now it's full of hopheads, teenagers, foreigners, minorities, criminals, walking dead, aliens, etc. I was robbed by a drug addict who had a knife. I never used to see threatening looking people hanging around back then (absolutely no racial implications—The person who robbed me was white). And yes, I was expecting someone to mention the Combat Zone, but the discussion was Downtown Crossing (basically what surrounds and branches slightly from the intersection of Washington, Summer and Winter Streets) not including the Combat Zone which was further down Washington Street and away from the shopping district. Start with the homeless people yelling at each other, then consider the open drug dealing, and go from there. And the Combat Zone which was right down the street, just a hop, skip and jump away, was, um, what? It’s amazing that DTX didn’t have a single cell phone store in 1964!